I am reading Ken Arnold’s Cabinets for the Curious: Looking Back at Early English Museums at the moment. Arnold uses a comparative approach to consider contemporary museums in context of the founding principles of museums of the 17th century. He discusses “three dominant strategies for knowledge creation in museums… the telling of stories, the use of objects, and the imposition of order upon them” (Arnold 2006, 4). As I’ve been reading the book, it has really struck me that, online at least, museums seem to be renegotiating these key strategies – moving away from both the use of objects to construct knowledge and away from strict taxonomies (since the Internet is much more rhizomatic than hierarchical). Instead there seems to be a renewed interest (also here, and here too) in the telling of stories as a primary driving force for knowledge creation online, and in making that relationship dialogic, rather than unidirectional. The urge to tell stories in museums can only be understood once the role of people as well as the object within them has been fully grasped, and this is crucially on both sides of the collector/curator – visitor/audience divide. Museums have always been places for people’s discursive lives: spaces for teaching and learning, but also quite simply for sounding off. 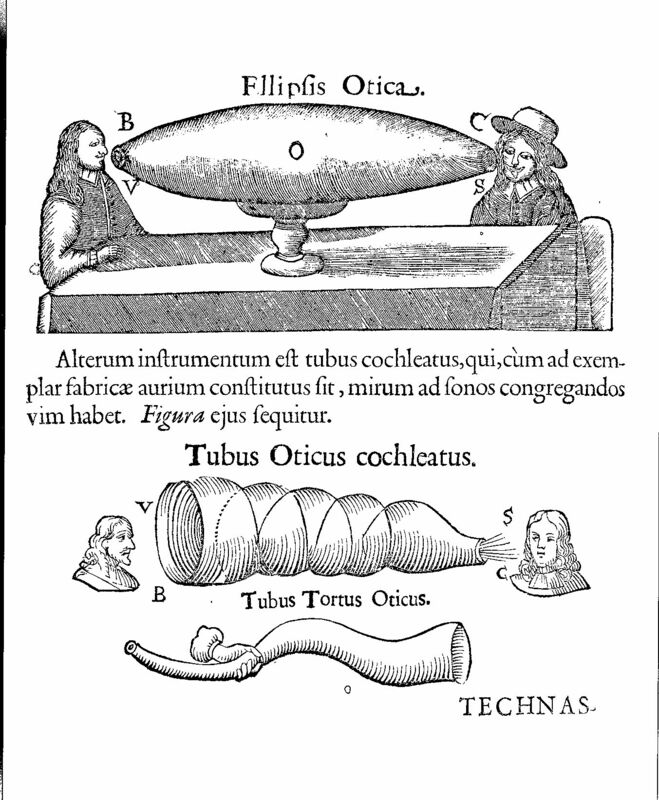 This is why it was quite natural for the sixteenth-century naturalist Athanasius Kircher to equip his museum with speaking trumpets, ensuring that curators and visitors were audible to each other – as if the significance of the spoken word was too great simply to be left to the vagaries of the unaided voice. I love that almost 500 years ago the creators of museums were grappling with – and finding solutions to – the same questions that we ponder today. creates a two-way audio experience for museum visitors influenced significantly by their physical location on deCordova grounds. Participants will use handheld wireless devices and headphones to listen to audio and also to make their own recordings which will be immediately assimilated into the piece for everyone to hear. Check out the below video to get a better sense of it, or read reviews by Nancy Proctor and Ed Rodley. Scapes Intro from Halsey Burgund on Vimeo. Slightly tangentially but also well worth reading is this book on the largely ignored ‘dime museum’ phenomenon – http://amzn.to/jGlkEy – which contemporary museums might still have concepts of theatricality and popular reach to learn from. Thanks Seb. I’ll check it out.